Explanation: Difficult to observe, the momentary green flash above the rising or setting sun has been documented as a phenomenon caused by the atmospheric bending or refraction of sunlight. Like a weak prism, the Earth's atmosphere breaks white sunlight into colors, bending red colors slightly and green and blue colors through increasingly larger angles. 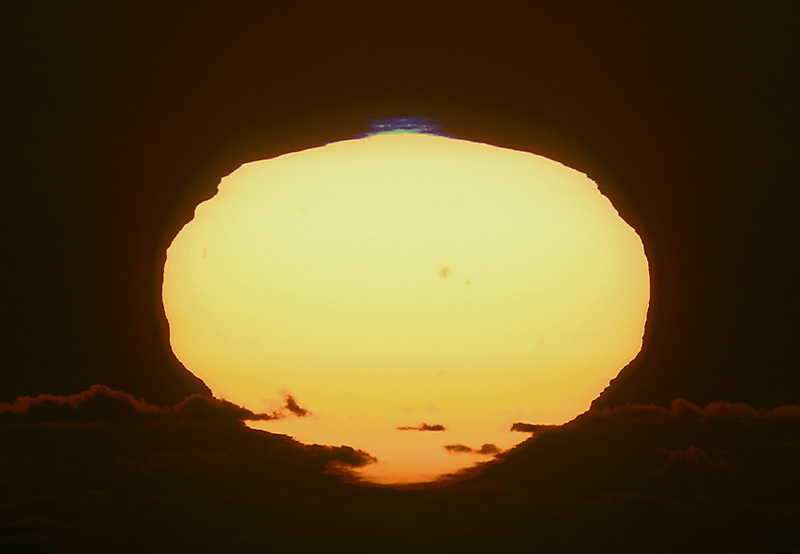 When the sky is clear, a green flash just above the sun's edge can sometimes be seen for a second or so, when the sun is close to a distant horizon. A blue flash is even harder to see though, because the atmosphere must be extraordinarily clear to avoid scattering and diminishing the refracted blue sunlight. Still, from a site near Roques de los Muchachos (altitude 2,400 meters) on La Palma in the Canary Islands, astrophotographer Mario Cogo captured this dramatic telescopic image of a blue flash on color film in October of 2001. 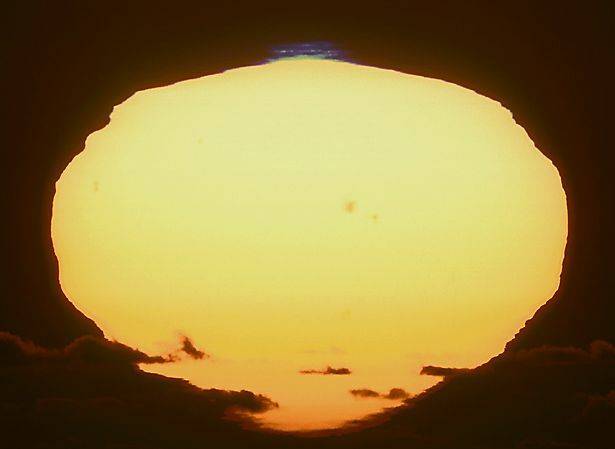 The image of the setting Sun with large sunspot groups on its surface is heavily distorted by atmospheric layers. A lingering green rim is just visible under the tantalizing blue flash.